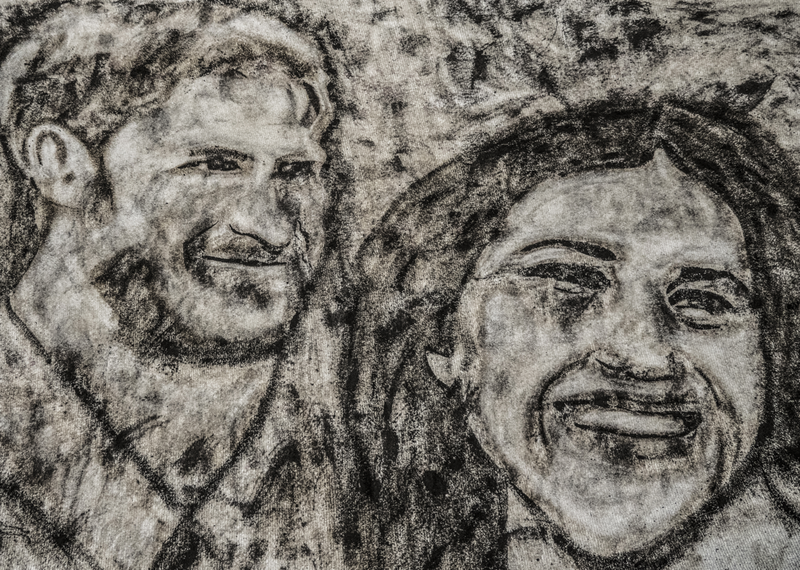 Newly engaged modern art lovers Prince Harry and Meghan Markle have been treated to a special engagement present: a portrait of the pair ‘cleaned’ out of a dirty carpet. Commissioned by Carpet Stain Remover maker Dr. Beckmann, the artwork has been created by artist Nathan Wyburn, who has previously depicted Mariah Carey out of glitter and Donald Trump out of tacos. The portrait, called ‘Love Cleans Up’, measures a massive 12ft x 16ft, and involved Wyburn using the award-winning product to carve through coffee, wine, and mud stains to re-create the lovebirds. The artwork was completed in just a day, and Wyburn used three bottles of the Dr. Beckmann product, which has been awarded Which? Magazine Best Buy four years in a row. The couple, who announced their engagement last month, are rumoured to be huge fans of modern art, and Prince Harry apparently wooed Meghan by giving her emerging artist Van Donna’s ‘Everybody Needs Somebody To Love’ early in their blossoming relationship. Dr. Beckmann spokesperson, Susan Fermor, said: “We recently launched a new curved brush for our Carpet Stain Remover product, so what better way to showcase its effectiveness than by creating our very own piece of carpet art. Artist Nathan Wyburn said: “It’s been a hugely excited project to work on – usually I work by adding unusual products to a base layer, but this piece is unique as it involves me reversing this process and removing to create my subject. “I chose to depict Prince Harry and Meghan Markle because not only are they big fans of modern art, but their story shows us once again that love is clean and has the power to bring anyone together, even if they come from different continents.